The Annihilator is a Boss you face in Lords of the Fallen. 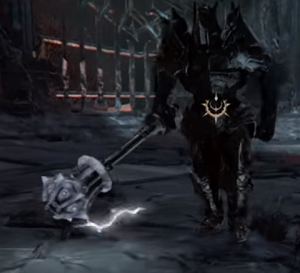 The Annihilator is the last Rhogar Lord in Lords of the Fallen. There are three ways to find him, and you need to go by 2 of them to use the lever which gives you access to another quest and final lord fight. The simplest way to defeat this boss is by standing back at medium distance and waiting for his "Hammer Throw" animation. Roll out of the way just before the projectile leaves him and you'll about dodge it in time. You can now run in and perform a 2-handed heavy jumping attack and a quick hit, then close of with a projectile from your Gauntlet. Hammer throw Annihilator throws his hammer towards you, then waits for it to comeback. Really slow attack, you will have a lot of time to hit him meanwhile. Horizontal slash. One handed slash, can have up to two moves if you stand too close once he ends the first. His favorite combo. Overhead two handed vertical hit, he then drags his hammer backwards only to come back toward you with a "uppercut" style hit and followed by a final overhead ground smash. Note that dragging his hammer around hurts you, and you can dodge the last hit by simply strafing around him. Lightning Ray. He'll start looking weirdly at his hammer and glow green, then he'll emit a huge AoE explosion that will stun you if you stand in it and starts firing a lightning ray at you, avoid this by turning your character around so he dosnt face him. If the ray hits you you'll be shocked and unable to move until it's over.